This elegant wood bathroom cabinet in modern look features 3 open shelves and 1 capacious storage room with a door offer ample storage space. It will help you to keep your things neatly organized. you can place your personal toiletries in it, while the open shelf is suitable to place towels, soap, tissues and other decorative items. 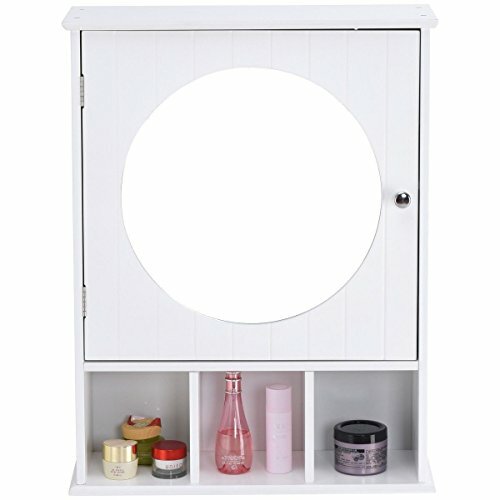 A door with round mirror, make you easy to make-up. Combined with modern style and ample storage space, it can be a great addition to your home. If you have any questions about this product by Moon_Daughter, contact us by completing and submitting the form below. If you are looking for a specif part number, please include it with your message.